Power outages occur more frequently than ever, last longer and can have devasting effects, especially if you rely in a sump pump to keep your home dry. From everyday necessities like heating, refrigeration and lights, to daily essentials like cooking, laundry and bathing, to home offices and computers, we need power! Stand up to unpredictable weather and unforeseen outages with standby power. 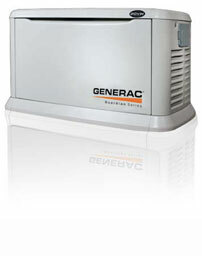 Ask us about installing a Generac generator for your home and never worry about a power outage again. Do you need a whole House Generator? When asking yourself whether or not you need a whole house generator, consider this: 3.5 million Americans are left without power in any given week. Many households experience up to five power outages annually. Power outages can wreak havoc with your home; burst pipes; freezing or sweltering temperatures, loss of lighting, spoiled food – all puts family members at risk as does loss of safety alarms. Add to that the possibility of a home based business going dark for a few days and computer data loss, and the result can be costly and frustrating. Whole house generators kick in automatically in the event your home goes off the grid. They supply the energy your family needs to keep operating normally until the power is restored. They also add value to your home. All things considered, they’re worth their weight in gold. Whole House Generators work off fuels such as natural gas or liquefied petroleum gas (LPG). Your fixed standby generator is connected to your home’s electrical wiring (usually indoors) and the fuel source. It may be started automatically or manually. The advantages of an automatic system are obvious. The ‘auto transfer switch’ detects a power outage and starts itself. When the grid voltage is restored, the system will connect you back to the utility lines and turn itself off. The process should be seamless with a transfer time of about 30 seconds or less.